The Boxing Truth®: Chisora-Scott:How long until the Rematch? The second step in the comeback of Heavyweight contender Dereck Chisora came on July 20th when the former world title challenger entered the ring to face undefeated American Heavyweight contender Malik Scott in London, England. Chisora who scored a ninth round stoppage of Hector Avila in April of this year was fighting for only the second time since suffering a fifth round knockout loss at the hands of two-division world champion David Haye in July of last year. Although some may have questioned why Chisora who had lost three of his last four bouts would take on a crafty boxer such as Scott, it is worth noting that despite suffering four losses in his career Chisora was competitive in all of those fights and had only been stopped once. An argument of some could be that despite an undefeated record of 35-0-1, with 12 Knockouts coming into the fight with Chisora that questions of how good Malik Scott was may have been warranted. In his last bout prior to facing Chisora in February of this year, Scott was the victim of what some feel, this observer included was a bad decision in his draw with undefeated Ukrainian contender Vyacheslav Glazkov. In my view Scott out boxed Glazkov over the course of ten rounds, winning seven out of ten rounds on my unofficial scorecard. There were two questions that I had in my mind leading up to this fight. Could Malik Scott use his lateral movement and quick hands to evade Chisora’s aggressive pressure style and box his way to victory or, would Chisora be able to effectively cut off the ring and nullify Scott’s movement before Scott could potentially build a lead on the scorecards? When the fight got underway it wasn’t surprising to see Scott establishing his jab as a focal point of his offense. What was a bit surprising however was how effective Chisora was able to use his pressure style to get on the inside of Scott early in the fight. In all honesty although I do not like to give solid predictions leading up to a fight, the way that I envisioned that Chisora could win this fight would be to gradually wear Scott down and possibly look for a late round stoppage. It was clear that Chisora’s pressure was bothersome for Scott. Chisora’s head movement in particular made it difficult for Scott to attempt to control the distance of the fight. Although Scott was able to get his punches off quickly, I wondered how the judges scoring would end up if the fight went to the scorecards. Round by round the fight was close as both Chisora and Scott were able to have their moments but as I have often said over the years in fights where there are many close rounds that could go either way, it will often boil down to what a judge prefers in their criteria of how they score. It was clear that Scott threw more in volume. It was Chisora however who was the effective aggressor and who landed the harder punches when he did let his hands go. Despite the subject of scoring at the end of this fight being insignificant it was worth questioning as the rounds went on how the judges were scoring if the fight were to get that far. Scott seemed to get the better of the action in rounds two, three, and five by being the more active of the two but he didn’t seem to be able to control the tempo of the fight as the rounds progressed. Although I had Scott slightly ahead after five rounds by a margin of three rounds to two, I wondered whether Scott would be able to conserve his stamina. Chisora was not only the aggressor in this fight but he was the fighter who was dictating the pace and made his opponent fight at a pace where it was more to Chisora’s advantage. Simply put Chisora made Scott work. One thing that was also noticeable was that Scott was backing straight up into the ropes throughout the fight and was not able to execute movement from side to side consistently. This could likely be attributed to Chisora’s head movement and pressure as he came forward. Scott however was effective in spots where he was able to land and slip out of Chisora’s punching range. As the fight entered round six there was a sense that the fight was starting to heat up. At this stage in the fight Chisora appeared to be landing more punches particularly on the inside to the body and the head. To his credit, Scott was effective in tying Chisora up on the inside throughout and this seemed to give him the slight edge in the fight up to round six in what was a very competitive fight. The fight would be brought to a sudden conclusion in the final seconds of round six when Chisora landed and overhand right that knocked Scott to the canvas. Scott did not appear to be badly hurt however the fight was stopped as Referee Phil Edwards stopped the fight although Scott had clearly gotten up at the count of nine. 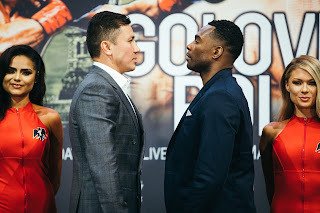 An appropriate quote that this observer has been known for saying frequently over the years when controversy emerges in the sport of Boxing “Like Peanut Butter and Jelly, Boxing and Controversy just go together…” seems to fall in line with the controversial way in which this fight ended. Although it may appear to some that this fight had ended under strange circumstances, it is not the first time that this observer has seen a bout ended in this manner. One such bout that immediately came to mind as I watched this fight conclude was a Lightweight bout that took place on July 31.1991 between then undefeated rising prospect Rafael Ruelas and Mauro Gutierrez a journeyman who had fought sixty-four professional fights prior to taking on the 27-0 Ruelas. The fight was ended when Gutierrez dropped Ruelas with a flush left hook to the jaw midway through the second round. Ruelas, on one knee took the count administered by Referee Chuck Hassett and arose from the knockdown at the count of ten as Hassett shouted “You’re out!” waving his arms signaling the end of the bout. It was clear that although hit with a solid left hook that Ruelas did not appear badly hurt. Ruelas subsequently protested the stoppage. Ruelas misjudged the count by one second before getting up from the knockdown. Almost twenty-two years to the day since the somewhat controversial end to that fight, the Dereck Chisora-Malik Scott fight ends under similar circumstances. Unlike that fight twenty-two years ago however, replays of the count administered to Malik Scott by Referee Phil Edwards clearly showed that Scott had gotten up from the knockdown at the count of nine just as Edwards waved his arms signaling the end of the bout. It was no surprise to this observer in the days following the fight to see Scott’s camp file a protest with the BBBofC. In all honesty if I were involved with a fighter who had lost a fight under these particular circumstances, my reaction would probably be similar to the reaction of Scott’s camp. After all, their fighter did indeed get up from the knockdown before the count was concluded and did appear to have all of his faculties. What are the results likely to be of the protest? From a speculative point of view such things that might come up in any potential hearing concerning this fight will probably revolve around the count of Referee Phil Edwards. In the aftermath of this fight some have stated to this observer that they did not understand why Scott did not get up from the knockdown earlier in the count. Only Malik Scott can answer that question however elements of crowd noise and trying to make sure the he (Scott) was okay before getting up from the knockdown could have played a factor. This is one reason why referees in addition to verbally administering a count will also visually indicate a count with their fingers while verbally counting. Did Malik Scott simply misjudge the count? Perhaps but even so he clearly was able to beat the count. Although at minimum a video review of the closing moments of this fight by the BBBofC could take place, it is unlikely in the eyes of this observer under these circumstances that the official result of a sixth round knockout win for Dereck Chisora would be changed to a no contest/no decision. At the end of the day it is simply a judgment/discretionary call by the referee in question. Unless something illegal had taken place such as an illegal punch that a referee did not see which may be cited as having caused a knockdown or something along the lines of a failed post-fight drug test, it is unlikely that a commission would overrule a referee for simply stopping a fight. It simply boils down to a referee’s discretion whether a count was fully administered or not. If history has provided any basis for circumstances such as this, the best possible solution for all concerned would be for a rematch to be ordered by either the BBBofC or the World Boxing Organization (WBO) who sanctioned the bout for it’s International title in it’s Heavyweight ratings. The bout was after all very competitive and was considered by almost all observers, this one included as a close contest at the time of the stoppage. So why not put a fair and just end to what some see as a controversy by mandating a rematch?